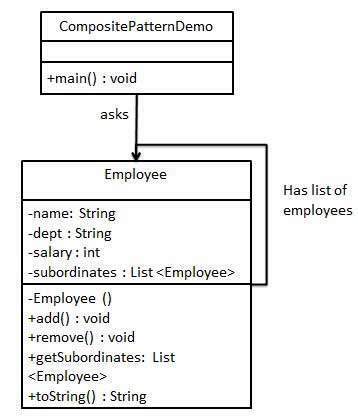 We are demonstrating use of composite pattern via following example in which we will show employees hierarchy of an organization. We have a class Employee which acts as composite pattern actor class. CompositePatternDemo, our demo class will use Employee class to add department level hierarchy and print all employees. Create Employee class having list of Employee objects. Use the Employee class to create and print employee hierarchy.